Synagag: No peep about pigskin will be heard inside Temple Emanu-El on Sept. 14. Photo via @AUFamily. 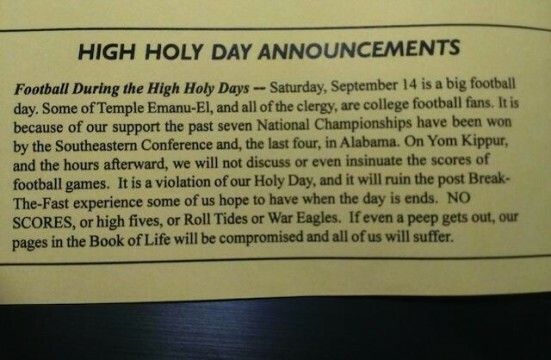 Auburn takes on Mississippi State during Yom Kippur while Bama meets dreaded Johnny Football. You can read more quotes about the houndstooth yarmulke Rabbi who issued the edict here. Related: And all God’s people said ‘War Eagle’.